Language Log » Trump's most mockable phrase: "believe me"
While it might not have been the most accurate impersonation, Kaine did latch on to one of Trump's most salient bigrams (i.e., two-word phrases). As Mark Liberman noted back in April (accompanying a video compilation of Trump as salesman), Trump had racked up 28 instances of "believe me" in the primary debates, compared to 2 for Kasich and 1 for Cruz (and zero for Clinton and Sanders). And in March, Tyler Schnoebelen shared an infographic that contrasted Trump and Cruz in terms of their most distinctive bigrams during their debate performances. 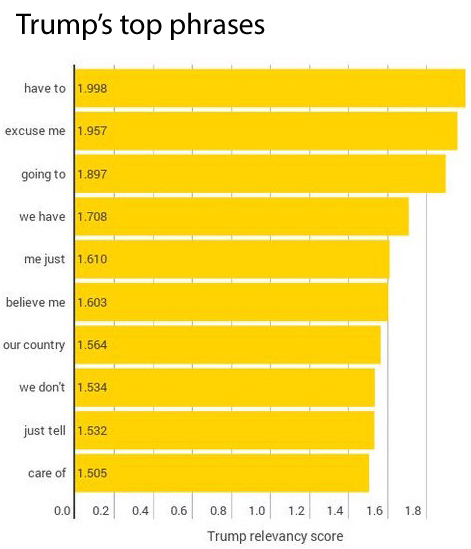 "Believe me," not surprisingly, was near the top of Trump's list. As explained in the infographic, a relevancy score was calculated for each bigram, following the methodology that Mark Liberman used in determining the most Trumpish words for a post last September (and further discussed in the ThinkProgress article, "What Language Experts Find So Strange About Donald Trump"). Now that Kaine is mocking "believe me," should we expect the frequency to fall in Trump's public appearances? Or will he double down on his favorite phrase? Someone should correlate this kind of statement with actual truth telling. I have a feeling that I know the result. I know Orwell has come in for some well deserved criticism here but I think he nailed this one.